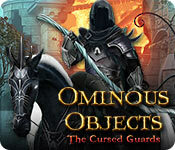 Ominous Objects: The Cursed Guards is rated 4.0 out of 5 by 9. Rated 5 out of 5 by denniann2 from a great HO game you are trying to solve an ancient mystery of the 4 knights. there is only one way to solve it and you need 4 relics to do it. i played on the custom level and had to skip a lot of the mini games. i solve a few. Rated 5 out of 5 by deddu from Haunted Armor Another great game in the series. There is a lot going on and all the mini-games offer a challenge. You can play them causal or hard. 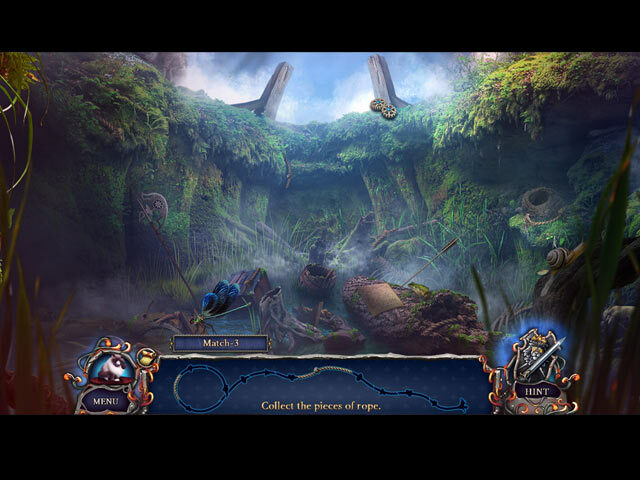 The hidden objects are varied and there are scenes where you place objects into the picture. You have all the standards: choice of mode of play; hint, map, teleporting and of course Mr. Jenkins. Rated 5 out of 5 by biscuitsmama from CAN YOU DEFEAT THE CURSED GUARDS AND RESTORE PEACE TO THE KINGDOM? Our Ominous Objects investigator, Leia is back along with her furball buddy Mr. Jenkins. There is foul magic afoot in the Cursed Guards as the retired Duke of Braunschweig obviously has too much time on his hands and has indulged in an obsessive search for some cursed armor that was long ago created by a deranged and evil king. It is said that the king had four sets of armor created that were imbued with evil magic and then gave them to his four loyal champions to control his kingdom after his death. A good knight who was pure of heart managed to destroy the evil knights and had their cursed armor buried in different locations, thus putting an end to the reign of evil terror and restoring peace to the kingdom. Having found the missing armor, the old Duke has now released terror once again in the realm. It now becomes your task Miss Leia to destroy the risen knights and save the kingdom. Great graphics and sound along with some fun gameplay make this game a keeper for me. Even though I am not a huge fan of pet helpers in games, Ominous Objects simply wouldn’t be the same without our feisty feline helper. Fortunately, Mr. Jenkins is not used overmuch in the game and when he is; his antics are endearing and entertaining. Your tools (aside from Mr. Jenkins) include an integrated map found early in the game that will help you navigate quickly to areas where you have available tasks. The HOP scenes are nothing new but some are creative. I’m not a huge fan of the storybook scenes and there is one that I found very difficult as the items to be found were almost invisible. I must have used the dreaded hint button four or five times to make it through that particular scene. Many gamers are older and monotone shade of gray scene becomes frustrating rather than fun. My eyes are very good and I still struggled to find items hidden on that misty gray statue. On the other hand, I found the puzzles entertaining and very enjoyable; with none being too difficult but at the same time adding to the storyline and gameplay fun. If you happen to prefer the CE version of a game, this one includes Collectible Cards and Morphing Objects hidden throughout the game. Achievements to earn, Wallpapers, Concept Artwork, Music, a Dots Game, Developers Diary, Bonus Chapter, and Strategy Guide. After playing the full game I can say that this is one of the best games I have played this year. I enjoyed the gameplay and ridding the kingdom of these restless knights. IMHO, The Cursed Guards is the best game in the Ominous Objects series. I know the theme is fairly much the same but I am an avowed HOPA addict and love playing each new game. There will be cries from those who say “same ole, same ole” but my response is, if you feel that way, why bother? The premise for HOPAs is always the same – find objects, use them and save someone or something, with a storyline thrown in for good measure. 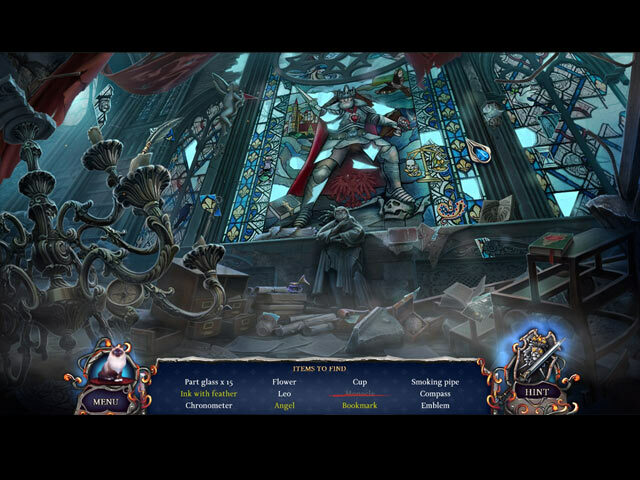 The storyline is very good in the Cursed Guards and I can recommend it as an excellent game if you happen to love HOPA games as well. Rated 4 out of 5 by samysam1313 from Good Game Based on finishing the game. Not a bad game, Especially since I got it as a Daily Deal. Graphics aren't bad but they aren't the best. Some of the HOS had hard to see items. Some were very small but they were different. I'm not much into mini games. I find most of them just more frustrating than fun so I skip a lot of them. A few I wasn't sure what they wanted but generally instructions are good. It's a good time waster. Story line was OK considering it's a fantasy. All in all I recommend this game but I wouldn't waste my money on the Collector's Edition. Rated 4 out of 5 by pennmom36 from MR. JENKINS IS READY TO TAKE ON THE EVIL KNIGHTS A King driven by madness, commissions four enchanted armors for his most trusted knight warriors. The Deathless Knights ensued corruption, as they spread panic and chaos throughout the Kingdom, becoming an unstoppable force of evil. Their reign ended when a young Prince with a pure heart, (exactly what constitutes a pure heart in the year 1546?) defeated the four Horsemen and scattered their apocalyptic cursed armor to the four corners of Earth, to ensure their fury would never reunite. Ahh, but never doesn't last forever, and Leia's paranormal ability to see Ominous Objects will be put to the test, as she tries to save the Duke of Braunschweig and his freshly coronated son from certain death. The Deathless Knights of darkness have returned from the grave! I'm not a huge fan of the Ominous Objects series, which has had several duds lately. But The Cursed Guards, might just be this series saving grace, it's not epic, but it is a pretty good game. The graphics are fantastic, the storyline is interesting, and Mr. Jenkins is once again the star of the show. In the Collector's Edition version, there are 14 Collectible Playing Cards, and 40 Morphing Cat Objects, that aren't that hard to find because all you have to do is look for a cat, but at least the cursor doesn't change to a hand to make it impossible not to find. There aren't a whole lot of CE Achievements to earn BUT, Daily Magic has added a fantastic Easter Egg feature, so read the available Achievements before playing the game, and use the clues given to find your eggs! 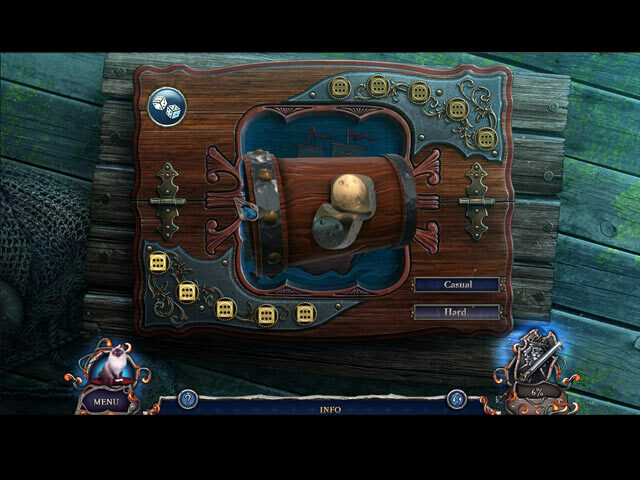 (when I say Easter Eggs, it means to search for something, just like searching for hidden eggs, not real eggs) The Hidden Object Scenes are really good, I normally don't get all that impressed by HOP's because they are usually so easy that I can find the items without looking at the list. Not so with these, my favorite was the scene where you find objects hidden within a statue on a wall, and the items are so creatively blended, that it was actually fun! There is an alternate CE Match 3 game as well. The Mini Games are good, but are little too easy and simplistic for the most part, even on the "Hard" difficulty mode. Below are brief descriptions of some of the games you'll encounter during the demo: 1) Maintain your balance using directional arrows. 2) Use directional arrows to rotate a disc maze to complete a path for the chips to travel. 3) Find and replace missing picture pieces. 4) Untangle a rope starting at the end, in the correct order. 5) Interact with a stage play by selecting specific available tabs. 6) Place all the various shaped pieces on the board so they all fit together. 7) Rotate disks to complete a picture. 8) Assemble map fragments correctly. 9) Select swords in a specific order, moving one sword may affect others. Ominous Object Games Available Family Portraits (7-17-14) Lumina Camera (8-11-16) Phantom Reflection (4-16-15) The Cursed Guards (4-27-17) The Trail of Time (12-19-15) The Collector's Edition has 6 Wallpapers, 10 Concept Art pictures, 4 Music Soundtracks, a game of Dots, 3 Developer's Diary pictures, 11 Achievements (with Easter Eggs!) 14 Collectible Playing Cards, 40 Morphing Cats, a built in Strategy Guide and a Bonus Chapter, enjoy! Rated 2 out of 5 by Pilot1 from Another failed attempt at Victorian ambiance! The story and game play have been well described by others, so I’ll not duplicate their good work. The graphics, music, background sounds, and voice-over dialog are all well done —except that I found the accent of the first character that you meet to be a little off from what it was meant to be, upper-class British. Once again we find ourselves in another era, and once again it is apparently Victorian. At least it appears so from the architecture, horse-drawn carriage, and style of attire seen here. Okay, but what are those high voltage searchlights doing here! And what am I doing replacing a wire in a live circuit with my bare hands! Oh, no, the lady just had a massive stone statue fall across her legs! Hurry, get the rope, rig a pulley, and lift that horrible, weighty mass off what surely are her mangled limbs! What, she’s not even scratched, let alone perturbed by this near-death event. I did not find the story line compelling, nor the characters particularly worthy of my caring what happens to them and cannot recommend this game to you. As always, play the demo and decide for yourself. Rated 1 out of 5 by roaming from Wow! There's a lot to not like about this one. First, there is the large side bar that pops out and just hangs there after you complete every task, an unacceptable annoyance in a current game. It reminded me of the very old HO games with the lists displayed in a banner hanging down the side of the screen. Then there's the constant back and forth, going and getting things to go back and do something else so you can find something else to do the thing you started out needing to do, all the while stopping to read piece of paper after piece of paper, and meanwhile the poor Duchess is trapped under a massive block of statuary as she watches her home burn to the ground. It took almost the entire 20 or so minutes I played of the demo to finally rig up a rope to hoist the block up and free her. Of course, once freed, she's unhurt, calmly stoic, with not a hair out of place. As another reviewer said, you arrive in your horse drawn coach wearing a long, Victorian style dress, repair the wiring on an high-voltage electric spotlight, climb a pole as it wobbles precariously from side to side, collect some gelantinous acid in a goblet (hopefully a glass one) to dissolve the bars in front of a culvert, and then crawl through the resulting puddle of acid and dissolved iron to get to the city gates, still presumably in that long dress, Of course, you have the cat Mr. Jenkins to retrieve things and bring them back to you, pretty amazing for a cat. My cat is only good at two things -- meowing plaintively when his dish is half empty and destroying upholstery. Hopefully, Mr. Jenkins will be able to follow you through that acid puddle without dissolving his little cat paws.